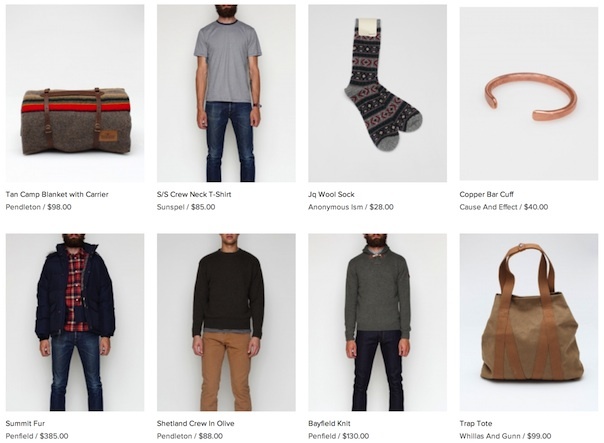 One of my favorite stores is Richmond, Virginia-based clothing and fashion accessories seller, Need Supply Co. While it is no where close to where I live — that is San Francisco — I still like their online store mostly because I find their website and curated list of items on sale fun to peruse. It isn’t the largest selection, but still, it is engaging. In the past when I visited their website, I had to click through a whole bunch of links to get a better sense of what was being offered. It wasn’t easy and it was time consuming. So a few days ago when I ended up on their website, I was pleasantly surprised. Gone was the old fashioned way of navigating through the wares. Instead, the site was offering a highly visual, grid-like layout that reminded me of, well, Pinterest. Need Supply Co isn’t the first site that is taking a cue from Pinterest’s design — several larger retailers are being influenced by the grid-style design philosophy that has been popularized by San Francisco-based Pinterest. In addition to Pinterest, I am also seeing Fashion oriented e-commerce sites take a cue from Tumblr as well. Examples of Tumblr inspired e-commerce sites include Of A kind and Le Coq Sportiff. Tumblr and Pinterest have become the Glimmer Twins of the fashion content platforms and are major sources of attention for brands and products. David Galbraith, an architect and serial entrepreneur who started Wists, a precursor to Pinterest, says that the “UI universe has boiled down to grids and feeds and slideshows, as far as I can see.” (His blog post for GigaOM explains it really well.) And we are likely to be married to those formats for a while, especially as digital information continues to grow exponentially. He argues that text will be primarily a feed — a theory that was popularized by blogs. Pictures will be in grids while videos and presentations are going to take cue from the slideshows. Today, focusing data into packages that are simply understood by humans is going to be a key challenge of the next generation of the Internet — a topic we are going to be discussing at our RoadMap conference on November 5 in San Francisco. Both Tumblr’s CEO David Karp and Pinterest’s CEO Ben Silbermann will be speaking at our event. To be honest, grid design is not new and has been around since the early days of the modern web. There was OMG from Yahoo that came to life in 2007. Tumblr had its wonderful archives. Why, even MSN had Wonderwall. (Check out these cool grid designs.) And there was NotCot. 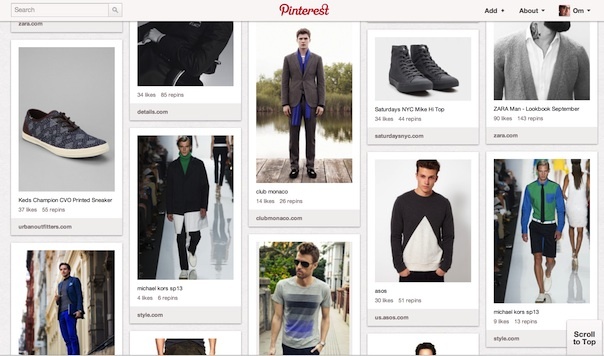 However, Pinterest and its explosive growth has made grid-based designs more accessible to many more people. Many of Pinterest’s users also tend to be those with active interest in fashion, design and products. As a result, these people can influence the purchasing decisions. Today, e-commerce companies are optimizing their websites to benefit from “pinning” and “tumbling” which means they are taking their design cues from Pinterest itself and are starting to resemble the traffic generating engine. I was reading this interview with Pinterest’s Silbermann on Fast Company’s website and I came across this comment by Leland Rechis, a director of product experience at Etsy. Michael Williams, who writes the influential menswear blog, A Continuous Lean, and works in the fashion industry, believes that the growing influence of these two content sharing networks is because they are highly visual and as such drive a lot of conversions. Sahil Lavingia, who worked at Pinterest before starting his own company (Gumroad) is of the opinion that the success of Pinterest is leading people to copy the Pinterest’s design, mostly because now the majority of the people understand how these visual grids work. But he cautions that to copy it outright is a bad idea for retailers. Why? Because while grid design is good for quick discovery of goods, it is still important to make the buyer take the final step: shop. That topic and a whole lot of other design questions will be part of the conversation at GigaOm’s RoadMap conference that I am going to be co-hosting with Katie Fehrenbacher. You’ll hear conversations with Silbermann and Karp, as well as other e-commerce thought leaders like Birchbox CEO Katia Beauchamp, and Warby Parker co-CEO Dave Gilboa. More details on the conference are here. Hope you can join us. While I agree visual should be the way to discover going forward (especially since the tablet will overtake the laptop soon), I think the Pinterest grid is a cacophony of information that much better organization is needed to it be more efficient for ecommerce. I’m also curious about the seemingly slavish devotion to top-down scrolling as the default experience for websites and apps. Great points. I do agree that the grid could use some clarity but it serves as a collage-experience. I am with you on the whole topic of top-down scrolling – time to try something new. Pinterest is just one of the by-products of this . In future e-commerce sites may be a grid of HD videos . My bet is that grids and feeds have been perfected, but I’m sure there is an opportunity with slideshows – to create a Youtube of stories. By merging the various aspects of screensaver photo albums, presentations (keynote etc.) and gallery sliders from web sites you could allow people to create a new content format that is a creative hybrid of text, video and pictures with the simplicity of blogging. The UI and look and feel is important for any website particularly one retailing merchandize. This is not sufficient of its own of course as there really needs to be a value-added dimension that appeals to consumers. We are excited to launch Flash Purchase with this in mind. Our value add is we empower consumers to create their own deals, join others and share them to gain the benefits of volume pricing not available to our users on an individual basis. I’m not following your points regarding Tumblr. The two sites you mention don’t show product in a long scrolling, ‘story A, story B, story C’ format. The only glimpse i caught was LeCoqSportif’s history under Marque, but this is parallax and that really is a whole different ball of wax. Of A Kind has a great editorial-like design and I appreciate the product + designer bio… I just don’t see the connection to Tumblr. It’s not for me, to much random data. Reminds me of Windows3 when people cluttered their desktop with rows and columns of icons to every file/app until they run out of space. I call it a dopamine junkie interface, won’t work in the long run. I’m going to go one step further and say that the Pinterest-style wall will be part of consumerization. As strange as that may sound, we’re embarking an internal project right now to create just such a capability as a social collaboration tool for sales and marketing (and the rest to follow). Personalized space that tells a story is the next level of maturity for collaboration. Great comment and thanks for sharing. I would like to know why you guys chose that “design” path and what is the impact. Appreciate you taking the time and sharing. Very welcome. There are many ways to collaborate and personalize. Social streams are one, and social ‘boards’ are another. Each has their place and value. As we roll out, I’ll let you know what we discover. As with anything that’s on the front edge of innovation, it morphs as it matures and sometimes becomes something unexpected.